Rolling River Spirits was named one of the 14 best distilleries in the west by Sunset Magazine. Mobile Distillery Row Passport Now Available! 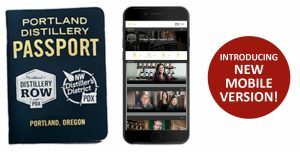 The Portland Distillery Passport offers an interactive and cost-saving tour of Portland’s top distilleries, including the famed Distillery Row and NW Distiller’s District. Nearly 100 unique spirits manufactured within Portland city limits… gin, aquavit, rum, whiskey, vodka, brandy, specialty liqueurs, and many more. The greatest concentration of distilleries in the world! The original passports are available at our tasting room and at other participating Distillery Row tasting rooms and online at ProofPDX. WW – Viking Drunk. It’s Aquavit Week. But until a decade ago, when Portland distillery House Spirits began making the first American aquavit, it was almost unavailable in the United States. In fact, only Norwegian Linie could be found. Even today, it’s hard to get the Scandie stuff: About half of the aquavits available in the U.S. are made in Oregon and Washington. To celebrate the obscure but wondrous herbal liquor, local bartender Jacob Grier founded Aquavit Week four years ago, with aquavit cocktails at more than 30 bars till Dec. 12 (full list at aquavitweek.com). Danes do aquavit like a shot of Jack. You raise your shot and clink glasses while always looking your clink partner in the eye (otherwise you lose your hair), tap the glass on the table and down it in one gulp. Then, you down a beer, too. Denmark is basically one giant, well-mannered frat house. When Swedes drink, they sing—there are around 9,000 drinking songs in the national registry. In 1957, when the Swedes won the world ice hockey championships, they didn’t know the words to their own national anthem so instead they sang a drinking song, “Helan Gar,” which loosely translates as “the whole one goes down.” ABBA and the Cardigans are also best understood only when drunk. Norwegians drink aquavit like Russians do vodka: with hard bread and pickled fish. If you eat, you drink, and vice versa. Those are the rules. Also, for whatever reason, Norwegian aquavit like Linie is aged in oak on a boat, and must cross the equator twice to be certified as Norwegian aquavit. This reminds the Norwegians of their history as drunken pillagers, but with fewer casualties. Just as many American craft gins are floral because of House Spirits’ lavender-rich Aviation, American aquavit leans hard on anise because of the influence of House Spirits’ Krogstad, which tastes like steroidal Fernet. Rolling River is making a specialty out of aquavit, with a fennel-caraway holiday version, a caraway small batch and a very dilly original aquavit that’s light and crisp on the tongue. Bull Run Distillery’s aquavit is aged in wine barrels and released each December—this year’s batch is sweet and anise-forward, balanced against the crackle of caraway. Eater.com features an article by Jacob Grier on Aquavit. Jacob Grier recommends 10 Aquavits to try including Rolling River Spirits Ole Bjørkevoll. Published April 21, 2015. Read article below or at Eater.com. Aquavit is on the rise, experiment with these 10 stellar bottles. Walk into most bars in the United States and the number of aquavits on the shelf will likely be zero or one. Perhaps there’s a bottle of Norwegian Linie or American Krogstad, or a dusty bottle of the no longer imported Aalborg, if the establishment doesn’t pour it often. Outside of explicitly Scandinavian places, the American attitude toward aquavit seems to be that having one option is plenty sufficient. But these bars are missing out. Though aquavit remains largely an esoteric spirit, it’s also one of the most diverse, and it’s enjoying a mini-renaissance among domestic craft distillers and importers. Much like gin, aquavit is defined in United States regulations by its primary botanical. While gin’s star is juniper, with aquavit, it’s caraway. Aquavit, a neutral spirit usually distilled from grain and flavored with botanicals, has been produced in Scandinavia for centuries. Much like gin, aquavit is defined in United States regulations by its primary botanical. While gin’s star is juniper, with aquavit, it’s caraway. To create unique expressions of the spirit, distillers often complement caraway with a myriad of spices and botanicals such as dill, cumin, coriander, juniper, fennel, anise, and citrus. Caraway notes are predominant in some brands, such as Brennivin, while in others these various botanicals sometimes take center stage. It’s a common misperception that aquavit is an anise-flavored spirit and one could argue that anise-forward aquavits are becoming a signature Pacific Northwest style, likely reflecting the influence of House Spirits’ popular Krogstad aquavit. Other aquavits from the region that also feature the flavor prominently include Sound Spirits’ Blekksprut, Old Ballard Liquor Company’s Nymodig, and Bull Run’s Regnig Dag. But many aquavits, in contrast, include no anise notes whatsoever. Like many other spirits, aquavits vary in their ages. While most aquavit in the United States is sold unaged, a few brands, like Linie or Riktig, are aged on wood such as oak or alder for a few months or years, though some Nordic brands age up to 20 years. Much like aging a whiskey or brandy, this time on wood both adds flavors and smooths out the spirit’s rough edges. Unaged aquavit is best served chilled, with the bottle pulled straight from the freezer or, for a more striking presentation, literally frozen into a block of ice. Although, some drinkers may prefer to sip aged aquavits at room temperature to capture the most nuanced flavors. In liquor stores and on bar menus, aquavit is often haphazardly listed among the sweet liqueurs, an indication of how poorly understood aquavit is in the United States. According to Nick Duble, bartender at mrnilsson, a Scandinavian pop-up in New York, “Usually if a restaurant has aquavit at all, they don’t have more than one … it just ends up in that section of the menu because there isn’t any other category for it.” Aquavit is a dry spirit, so clumping it amongst liqueurs make no sense. It warrants its own listing, perhaps in proximity to the gin or vodka section. In Scandinavia, the traditional way to drink aquavit is socially with food and friends, poured into small shot glasses and taken in one swig with a toast of “skoal!” But in the United States, aquavit is most often mixed into cocktails. Given its similarities to gin, bartenders sometimes substitute it into classic gin drinks like the Martini, Negroni, Collins, or French 75. Yet aquavit’s savory notes can also play well in other contexts; it’s not uncommon to see it offered in a Bloody Mary with delicious results. It also does well in spirit-forward drinks such as David Wondrich’s Old Bay Ridge cocktail, a riff on the Old Fashioned that splits the base spirit with equal parts aquavit and rye whiskey. A few years ago, most of the aquavit available on the American market was imported from Norway, Sweden and Denmark. Imports gradually tapered off as producers focused on the European market, and what we receive here is a mere shadow of the bounty available in Scandinavia. For an idea of what American drinkers are missing, scan through the spirits menu at Øl & Brød, the ambitious Copenhangen bar and restaurant run by the famed Mikkeller beer company. Dozens of aquavits grace their list, including vintage releases dating back to 1982. Though American imports have declined, new offerings from small domestic distillers have appeared in increasing numbers, often as a side project and sometimes as the core of their business. Like gin or vodka, aquavit offers economic advantages to producers since it can be sold unaged and can be made from a base of neutral spirits. As more Americans discover aquavit, the number of brands available will likely continue to grow. Below, a guide to ten aquavits that showcase the diversity of the spirit, all currently on the American market. Some are widely available, while others will take some hunting to track down. Regardless, they’re all worthy of a spot on the back bar. Until recently, Linie was the last Scandinavian aquavit with broad American distribution. This mellow Norwegian distillate has a famously unique production process in which it is stored in sherry casks and aged at sea as it travels from Norway to Australia and back, crossing the equatorial line (or “Linie”) twice. Pro tip: Peek inside the bottle to the reverse side of the label to find out exactly when your batch traveled the seas. The newest imported aquavit on the market has the distinction of being Foo Fighters frontman Dave Grohl’s favorite. Affectionately known as the “Black Death” due to its stark black label and its impact on those unaccustomed to taking schnapps, it’s nothing to be afraid of. In fact, it’s an aquavit with a crisp, straightforward caraway flavor. Now that it’s finally available in the United States, expect to find Brennivin at hip bars across the country. Keep an eye out as well for their extremely limited Christmas aquavit aged in sherry and bourbon casks, which will be exported to the United States for the first time in late 2015. Mike McCarron, the owner of Gamle Ode, fell in love with aquavit on trips to Iceland working as a skiing coach. Unable to find the aquavits he loved in the United States, he decided to make his own. The result is a line of three aquavits distilled in Wisconsin by 45th Parallel. Celebration aquavit is his take on traditional Danish snaps with caraway, dill, juniper, coriander, vanilla, star anise, and citrus peel, aged in a blend of wine and bourbon barrels. The annual Holiday release combines traditional botanicals with orange peel, mint, and allspice, and is aged in wine barrels. Both are wonderfully complex, but it’s his flagship Dill aquavit that steals the show, with a clean, unmistakable dill aroma. It’s unlike any other spirit on the market, and is one of the best aquavits available in the United States. No domestic producer makes more aquavits than Old Ballard Liquor Company. Setting up shop in the heart of Seattle’s Scandinavian neighborhood of Ballard, this distiller offers a rotating selection of seasonal aquavits alongside other staple spirits. At the core is Riktig, a caraway-forward aquavit aged with alder wood. Midsommar dill and Alskar citrus round out the main line; the rare Ragnarok weighs in at 120 proof, and the Skogen flavored with fresh spruce tips arrives in June. Old Ballard’s aquavits are often distinguished by a two-step process in which a distilled, clear spirit flavored with caraway, known as a “taffel” aquavit, is then infused with additional botanicals. One of the regrettable trends in liquor marketing is the tendency to blend two unrelated yet popular spirits, resulting in combinations that mix tequila or cognac with equally marketable vodka. Solståndet takes the opposite approach: it’s a mash-up of two very hard to market spirits, aquavit and genever. This “maltat akvavit” marries the malty backbone of genever with a spring-inspired aquavit carrying distinct notes of dill and lemon. Oh, and the first imports were distilled in France, not Scandinavia, though production is shifting to Iceland. A strange spirit? Yes, but also a strangely alluring one. Distilled by House Spirits and named after co-founder Christian Krogstad, this is the first aquavit that many American drinkers have tried. Now offered in two expressions, the unaged Festlig and aged Gamle, these are the most anise-forward of the aquavits sold in the US. They play very well in cocktails that benefit from using a dry anise spirit. One of the first products from Portland, Oregon’s new Rolling River distillery is Ole Bjørkevoll, named after a Scandinavian fisherman who emigrated to the Pacific Northwest in 1924. What it lacks in easy pronunciation it makes up for with a delicious botanical blend of dill seed, fresh dill, caraway, fennel, and juniper. It’s lighter than many American aquavits, making it very drinkable yet still complex. Rolling River has several additional aquavits planned for release in the coming year, promising to make them one of the most interesting aquavit producers in the United States. At 90 proof and packing a powerful hit of cumin, the Private Reserve aquavit from Chicago’s North Shore distillery possesses a spicy kick. This is mellowed a bit by aging in new American oak, but it’s still an assertive sipper. With its strong botanical note, it makes an excellent substitute for gin in a Negroni. One of the best aquavits for sipping cold and straight comes from the Montgomery Distillery in Missoula, Montana. Distilled from wheat with caraway, bog myrtle, lemon peel, and other botanicals, it has an approachable flavor profile that wins over aquavit enthusiasts and skeptics alike. Translated as “rainy day,” Bull Run’s Regnig Dag aquavit is aptly named for its annual December release in Portland, Oregon. It’s flavored with caraway, coriander, and fennel, all of which are present on the palate without any one spice landing out of balance. Complex and smooth thanks to a year of aging in wine barrels, it’s of the best aquavits for sipping neat without chilling, and also works beautifully in cocktails. Below is Rolling River’s section of the Willamette Week article written by Matthew Singer. To read the entire Willamette Week article published on November 19, 2014 click here. 1215 SE 8th Ave., Suite H, 236-3912, rollingriverspirits.com. A distillery tasting room can often feel like the perfume counter at a department store, with a paid shill regurgitating advertising copy while mixing in enough improvised banter to make it seem like a genuine human interaction. At Rolling River, the experience is more like entering a stranger’s living room and having them show off photos of their grandkids. A true mom-and-pop enterprise—or, rather, mom-pop-and-son—head distiller Tim Rickard graduated from homebrewing in 2011 and established Rolling River with his father, Rick, and mother, Joan. Even after moving up to Distillery Row this year, the company remains all in the family, and devoid of pretension: Pouring samples from behind the handsome curved wood bar in their small, open warehouse space, Joan talks up the liquors as if she’s in her kitchen auditioning them for the neighbors. It’s a charmingly homespun operation, but the products are elegant and sophisticated. There are only two being bottled at the moment—an impeccably smooth vodka, made in a still Tim Rickard hand-built himself, and a deliciously flowery gin. But whiskey, flavored rum and an aquavit are in the works. MATTHEW SINGER. Tastings & Tours: 4:30-7 pm Friday, noon-5 pm Saturday-Sunday, weekdays by appointment. $5 for samples of the vodka and gin, plus a mini-cocktail and complimentary shot glass. A tour isn’t necessary; you can view practically the whole operation from the tasting room. Drink this: The remarkably sippable gin ($26.50), accented by hints of star anise and juniper. Reviewed by Pour Fool – read article here and below. SEPTEMBER 3, 2014 Read Mary’s Vindulge blog here or below. Let’s talk about vodka shall we? Why not? Kids are back in school and folks are already talking about cooler weather and heartier food… in other words, the F word — fall! This whole fall business makes me uneasy since I’m a little obsessed with summer and don’t want to see it go (ever!). Vodka cocktails, like the one below, are a way to make it feel like summer year-round. And because we’re talking about vodka today I wanted to introduce you to a new vodka producer on the block. Founded in 2011 Rolling River Spirits is a small family-owned and operated craft distillery located here in Portland, Oregon. Run by the Rickard family (Tim, Rick, and Joan), the company focuses on artisan spirits using fresh organic ingredients. I had the opportunity to meet the family earlier this summer and check out their newly opened tasting room located in Portland’s Distillery Row to see what they have going on. The small facility is home to hand-built stills, production equipment, and a quaint tasting room where you can enjoy their current offering. At the time of my visit they were only making Vodka, with plans to soon release a Gin and Whiskey. reviewed by Brett Konen – Sip Northwest Magazine. Read article here or below. Portland’s Rolling River Spirits hones in on one thing: distillation as a pure art form. Founded in 2011, Rolling River (part of the Rose City’s spirit-saturated Distillery Row) is owned and operated by the Rickard family, each member an artisan in his or her own right and all with “a keen interest in craft and dimensional arts.” The core team members—Tim (whose art has been commissioned and showcased in galleries up and down the coast), Joan (in her free time an avid quilter and gardener) and Rick (fascinated by the intersection of art and spirits)—are on the first bottling of their first vodka recipe, which provides a concrete example of that focus on artistic purity. Crystal-clear in color, distilled from pure and organic grains with pure Portland water direct from Portland’s iconic and tallest neighboring peak (Mount Hood), the vodka is designed to showcase grain character rather than slink guiltily away from it. Warm with the smoothness of wheat and the subtle spice element imparted by rye, the spirit will play well with other mixers but should also be sampled straight at least once to appreciate the artistry behind it.